“Vacation with God: The Ten Commandments”: Summer Camp for Children in Philadelphia – St. Sophia Religious Association Of Ukrainian Catholics, Inc.
During June 25-29, 2018 a Summer Camp for Children “Vacation with God: The Ten Commandments” was held at the Basilian Spirituality Center in Jenkintown, PA. 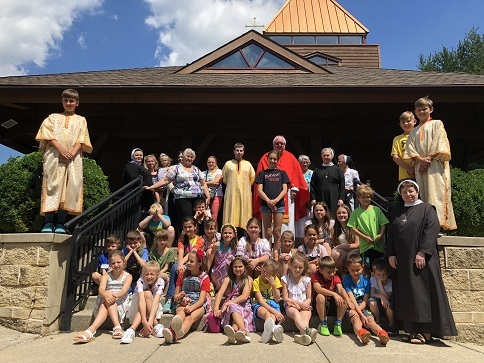 The camp was organized and sponsored by the Sisters of the Order of Saint Basil the Great and the St. Sophia Religious Association of Ukrainian Catholics, Inc. 29 children aged 6-12 from various parts of Pennsylvania participated in the event. The theme was based on the Ten Commandments. The dos and don’ts of God’s 10 Commandments show us how to apply love in every aspect of life. Jesus Christ summarized all of God’s laws in two great commandments. “‘You shall love the LORD your God with all your heart, with all your soul, and with all your mind.’ This is the first and great commandment. And the second is like it: ‘You shall love your neighbor as yourself.’ On these two commandments hang all the Law and the Prophets” (Matthew 22:37-40). The camp’s program was created with the goal of molding the spiritual and cultural heritage of the Ukrainian people. The children enjoyed catechism classes, songs, dances, crafts, embroidery, games, and drama club. They visited the Ukrainian Heritage Museum at Manor College and Beth Sholom Synagogue. The program was coordinated by Iryna Ivankovych of St. Sophia Religious Association, and conducted by Sr. Teodora Kopyn, Sr. Olha Mykhayliuk, and Sr. Vasylia Khvasta, with the help of volunteers: Andrew Perrong, Catherine Gorodenchuk, Melania Shnitser. The Divine Liturgy was celebrated by the Very Rev. Msgr. Peter Waslo. This was the third mutual initiative of the Sisters of St. Basil the Great and the St. Sophia Association in the field of spiritual and cultural upbringing of Ukrainian children and youth in the US. Posted in Events, Новини ТСС.